Psychic & Spiritual Tarot Card Reader of Pleasanton, California, offers guidance, peace of mind, and the courage to find what you are looking for. 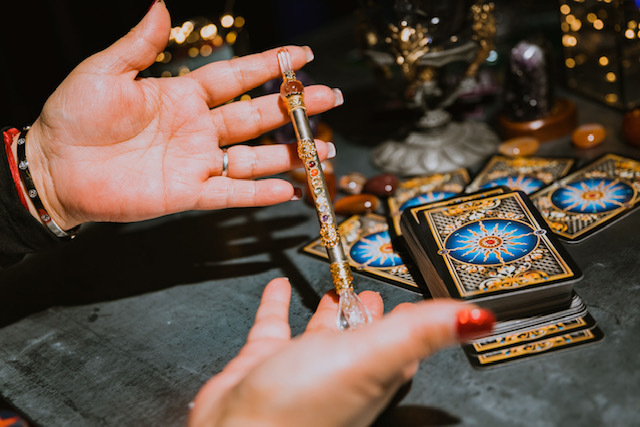 With tarot cards and palmistry readings, she helps to keep you grounded and helps you make decisions about your career, love, life, family, and reconnection with your soul-mate. Tarot cards are a popular tool used for spiritual introspection to uncover truths about your life. Using a deck of tarot cards, Miss Laura provides a straightforward, honest reading. Specials when you mention this site. With a Tarot reading, energy and interpretation play a key role, card selection placement and relationship to their focus and intention provide insight that provides insight regarding the concerns about love, family, career and money. Find out how the past influences your present and how to lay a clear path for your future. Palm readings are a form of reading the energy for your life that reveals a broad overview of details about your past, present, and future. They help you find the answers you are looking for in life and provide information about what steps you should take next. Contact spiritual advisor, Miss Laura, for tarot card readings and palmistry in Pleasanton, California.